Here's a great craft idea for kids to use this 4th of July ... it's a patriotic hat and it's gorgeous to look at and fun to make. The kit comes with everything you will need to make 12 of these cute hats...perfect for birthday or 4th of July parties to keep the kids engaged and having fun. 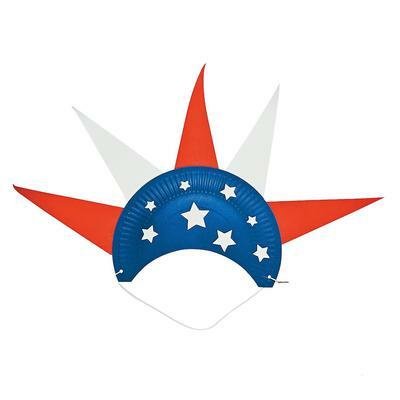 These easy paper plate hats will make your kids feel like Mister or Miss Liberty on this special day. Have a parade and let everyone show off their hats at your patriotic party this summer. Crafts for kids are a great way to keep those kids busy and happy! I had to get this kit for my 4th of July party! I know the kids are going to love making and wearing them. Join in and write your own page! It's easy to do. How? Simply click here to return to Paper Plate Crafts.